Such an ugly, unforgiving word. Full of pity and dismissal, and nothing like the life Elspeth Otis had always dreamed for herself. Nothing. She looked at the birthday present in her hands as if it were a spider, when, in reality, it was only a silly lace cap, delicate, frilly and handmade. But Elspeth felt its uneasy touch settle upon her skin like a stray cobweb stretched across the garden, unseen and unavoidable. And somehow inevitable. Time had flown with such cruel speed that she had somehow passed straight through the years of great danger, to arrive at this time even more desolate and desperate. Because the present of the cap meant that she had, on what otherwise ought to have been a most pleasant day—her four and twentieth birthday—irrevocably joined her spinster aunts on the shelf. Only women of a certain age wore caps. And unmarried women who put on caps were all but saying they had given up all hope of ever finding their true love. Given up believing such a man even existed. Elspeth did not want to give up hope, but the plain truth was that she hadn’t much chance for finding true love, living with her aged aunts—the sisters Murray, as they were known—in a tiny, thatched cottage, at the bitter end of a lane, in a forgotten village at the edge of the world. The idea of finding true love seemed as far-fetched as finding a pot of gold hidden in the garden. “Put it on,” urged Aunt Isla. Elspeth held the fine lace creation up to the light and attempted to make appropriately admiring sounds. “So very pretty,” she managed. Really, it was pretty—fine and delicate and exquisite as spun sugar. And yet she could not bring herself to put it on her head. She racked her brain for a suitable excuse. Anything would do—anything that wouldn’t hurt any finer feelings or seem ungrateful. Anything. A sound came from without—the jangle of harness and the creak of cartwheels on the rutted track running up to the cottage. “Someone’s in the lane.” Which was both a mercy and a true diversion—normally no carriages stopped at Dove Cottage. But Elspeth meant to make the most of the distraction, even if it were just a drover who had lost his way. Anything to put off the inevitable. This was Elspeth’s task in life—to have a care. To never call attention to herself, nor give up her guard against her tainted blood. To keep vigilant against all manner of mischief or mischance lurking within and without. To keep safe, and quiet, and not—under any circumstances—to be herself. Elspeth rushed because she was trying to outrace the dreadful dullness of her life. But also because a clarty, mud-splattered dray was drawing up beside their gate, and the driver was looking meaningfully at their cottage. “Deliv’ry fer Miss Otis,” bawled the driver over the chitter of the rain, shooting his thumb over his shoulder at the large tarpaulin-covered mound in the muddy well of his dray. “There must be a mistake. We’re expecting no deliveries.” Aunt Molly called from the doorway, waving her arm to shoo the nuisance of a mon away from the gate, as if he were a large, mud-splattered midge. His words doused her aunts more effectively than any downpour—they shrank back into the doorway, as if the dray might contain some great calamity instead of what was undoubtedly some commonplace item—for nothing outside of commonplace ever occurred in their village. That Wastrel being her late, unlamented father. Of whom Elspeth was never to speak. A piece of what, Elspeth did not ask. She was too busy overcoming the curious shock of learning she had any other kin in the world besides the two elderly relations in front of her, let alone a woman who lived so close as Edinburgh. The metropolis was a little over twelve miles to the north and east, but for Elspeth, who had never been allowed to venture farther than the next wee village, it might as well have been the farthest reaches of the heathen Americas. “Because a more scandalous, scarlet woman of Babylon never lived,” was Isla’s fervent opinion. “We thought it best,” was Molly’s more decorous judgment. Another fraught, stony-faced look passed silently between the two elderly sisters. “The iniquitous influence,” Isla amended. Elspeth braced herself for the lecture she knew would be coming following the mention of her long-dead father. John Otis had done three things to earn the sobriquet of “That Wastrel”. 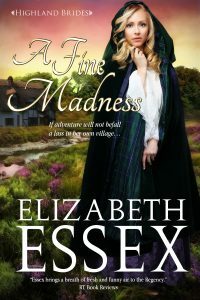 First, he had fallen in love with her mother, the Aunts’ lovely youngest sister, Fiona, which had led to pregnancy, Elspeth’s birth, and shortly thereafter, her mother’s untimely death. Secondly, he had written a book so scandalous, licentious and popular that it had subsequently been banned from publication. And lastly, he had, in his grief over his young wife’s death, slowly drunk himself to death, leaving his only daughter to the tender care of the only family she had left in the world—her devoted, but strict, spinster aunts. “We wanted to wait until you were older,” Aunt Molly tried to explain. “Old enough to know better,” Isla added. Well. She was certainly old enough now, wasn’t she, now that she was a dashed spinster? “Aye, there be a letter, too.” The dray mon slapped into her palm a thick, expensively papered letter with Elspeth’s own name in an elegant scrawl across the front.